Don't be chicken . . . . . enjoy garlic! My column last week looked and talked a little about garlic <click here> so as promised it is a follow up this week about this marvelous plant. 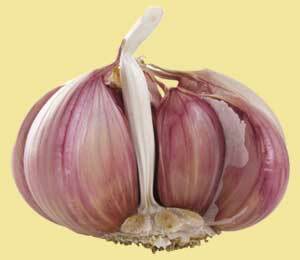 Garlicactually belongs to the lily family and is a sterile plant (cannot be grown from seed). Garlic has been revered for centuries and not just by the French. Around the world, for over four millennia garlic has held many important roles in daily human life. It has not only been used for cooking but was also taken therapeutically and nutritionally by the ancients long before modern day scientists proved its medicinal properties. Garlic is attributed with good luck and protection against evil. We all know that a stake through the heart and the smell is said to kill and ward off vampires but garlic is said to be also good against sorcerers, werewolves and warlocks! So maybe a garlic steak? . . . . . Beyond the superstitions, modern research has confirmed what our ancestors believed and practiced for centuries . . . the health benefits of garlic. Research in 1858, by Louis Pasteur, documented that garlic kills bacteria. During World War II, when penicillin and other drugs were scarce, garlic was used as an antiseptic to disinfect open wounds and prevent gangrene. Surprisingly, the way garlic is prepared appears to affect its healing qualities: when the clove is cut or crushed, an enzyme contained within the plant cells combines with an amino acid. This creates a new compound, called allicin, which has been shown to kill twenty-three types of bacteria, including salmonella and staphylococcus. When garlic is heated, a different compound is formed that can prevent arteries from clogging, and reduce blood pressure and cholesterol levels. The blood-thinning quality of garlic may also be helpful in preventing heart attacks and strokes. Maybe this partly explains the low level of heart problems with the people of the Mediterranean? It can also apparently kill sixty types of fungi and yeast, among them are the common causes of athlete’s foot. A problem most professional chefs have come across and why an old Indian chef friend of mine once told me to cut a clove and rub it between my toes once a month! Before cooking up a storm with my recipe for the week, read my Top Ten Garlic Cooking Tips first. What an amazing little dish this is. Only three ingredients and three stages of preparation, it looks initially like “What? How much garlic?”. But trust me what you are left with is a wonderfully, mild flavoured chicken where the garlic has just permeated the cooked flesh and lightly perfumed it. Care must be taken though to either use un-peeled cloves or if you want to peel them do so carefully so as not to pierce the outer layer . . . so why go to all that trouble when unpeeled is just fine!? As always with whole chicken please ensure you remove the giblets from the centre of the chicken and rinse thoroughly, inside and out under running water. Place the chicken in a large saucepan with the garlic cloves and pour over the chicken stock (must be just a mild flavoured stock). If there is not enough stock to cover the chicken add more: this will be dependant on the size or surface area of the pot. Slowly bring the stock to a boil, turn down the heat to a gentle simmer, cover and poach for 45 - 60 minutes. Remove chicken and carve into portions and set aside, remove the garlic cloves and set aside. Bring the stock to the boil and taste, if it requires strengthening allow it to simmer until it reduces to the flavour you require. Thicken with arrowroot, cornflour or flour mixed with water. Serve this dish with or without the garlic cloves, some light, fluffy mashed potatoes with lots of chopped parsley in and a simple, crisp tossed salad. Cooking time will vary depending on the actual size, thickness and tenderness of the chicken. Test by cutting the skin between the legs and breast and looking at the thigh joint. If it is still showing blood or pinkness poach it longer. Enjoy your garlic chicken and bon appetit . . . . .